was appointed to the Regular Army one year later. His first assignment was to the Base Quartermaster Office at Fort Devens, Mass. Later he served with the First Infantry Division in Massachusetts and Florida. was a squadron commander. He participated in both high- and low-level attacks on Japan leading several of these missions, including one in which the Mitsubishi aircraft plant was obliterated. 1950 he was assigned to U.S. Air Force Headquarters as a section chief in the Guided Missile Branch. From August 1950 to July 1951 General O'Neill attended the graduate school of the University of Pittsburgh and received a master's degree. He was next assigned as Deputy Chief of Staff, Comptroller, at the Air Force Missile Test Center, Patrick Air Force Base, Florida. to the Air Force Ballistic Missile Division, Inglewood, California, where he served successively as assistant deputy commander, then deputy commander, Ballistic Missiles; and Deputy Chief of Staff, Plans and Operations. In August 1961 he was assigned to the Office of the Secretary of Defense and served in the Office of the Director of Defense Research and Engineering as assistant to the deputy director (Weapons Systems) and later as director of the Director's Staff Group. In July 1964 he was transferred to L.G. Hanscom Field, Bedford, Massachusetts, as commander of the Electronic Systems Division, Air Force Systems Command. In July 1967 he assumed duties as commander of the Space and Missile Systems Organization, AFSC, Los Angeles, California. General O'Neill assumed duties as vice commander, Air Force Systems Command, Andrews Air Forte Base, Maryland, in September 1969. 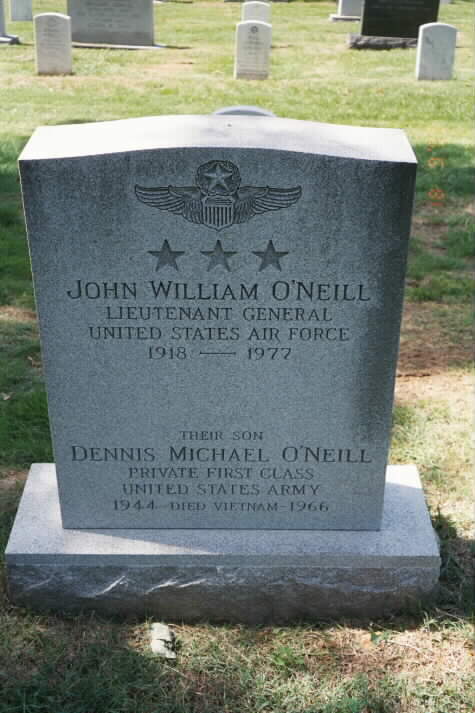 The General's son, Dennis Michael O'Neill, Private First Class, United States Army, was killed-in-action in Vietnam in 1966 and is buried in the same gravesite.